Monday evening...what are your evenings usually like? Though I am not huge on sitting in front of the TV, I do have some shows I enjoy. Tonight, it is Disappeared, Stolen Voices, Buried Secrets *aka creepy dead voice show* and of course the Real Housewives. Yes, I am completely addicted to all the Real Housewives shows. Not Miami, that was lame. I am sucked right into all the Kardashian drama and never mind Rachel Zoe. I have had all the Food Network I can take for now. I can only see the same dish cooked so many ways before I just can't do it. I die for Anne Burrell and had tickets to see her not been 1,000.00 a piece, I would have a framed photo of her and I at the Food Bank of America Fundraiser last year. I DVR these shows, and then treat myself to watching after I accomplish certain IMPORTANT things I need to accomplish in my day. I often consider what I watch, mind rot. But I am addicted and therein lies the problem. I don't watch the news, I occasionally read it online, I don't see any reason to know every shooting, political jargon, or what celebrity is "bumpin' ugly's" with someone else's husband/wife. But do NOT keep me from my Real Housewives shows. Got it? Preheat your oven to 400 degrees. In a large Ziploc bag combine, soy sauce, ginger, hoisin, pepper, and garlic. Add in chicken, push out air and seal bag. Mush around for a few minutes until all chicken is coated. Marinate at least 3 hours, overnight would be awesome. Remove from bag and skewer using a weaving method with the skewer. Lay on foil lined cookie sheet in a single layer. Bake for 20-25 min *maybe less for tenderloins*. Flip halfway through and baste with remaining hoisin. These can also be cooked on your outdoor grill. Grill approximately 10 minutes on each side, while still basting or until cooked completely through. 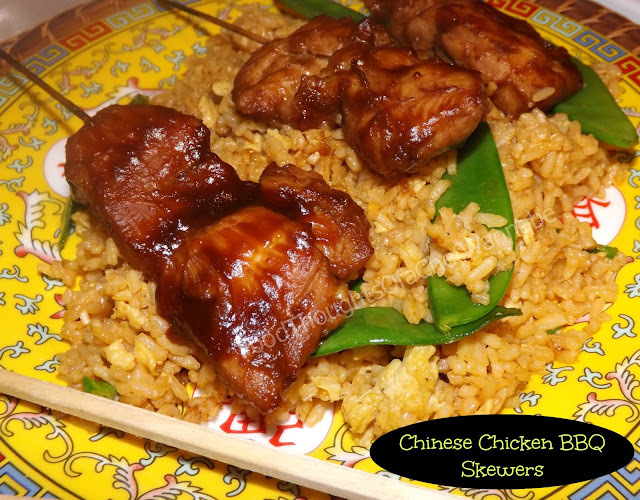 You can serve these with rice, use in lettuce cups, wraps, or over lo mein. Or, just enjoy them alone!!! Sound really good and easy!! I will have to try. I am not a fan of ginger so guessing I would use the smaller amount. Thanks!! My husband hates ginger, which is why the small amount. He never even knew it was in there, the hoisin takes care of that! Let me know if you try them! Enjoy! Sounds easy and delish! I LOVE ginger (Ginger Beef is my favorite Asian dish) So I'll grate some fresh root in there for sure. Yummmmm. Thanks!